More and more craft breweries are distributing beer in cans. Just last week, Redhook announced the release of Long Hammer IPA in 12 oz. six packs. Cans offer many benefits over glass. Besides weighing less and being impenetrable to light, you can take cans into places where glass is not allowed--a big advantage with summer coming up. Redhook was kind enough to send me one of the new six packs. Here's my full review of Redhook Long Hammer IPA. For more details about the cans, check out the press release below. Have you tried Long Hammer? What's your favorite canned beer? Where Will You Crush Your Redhook? 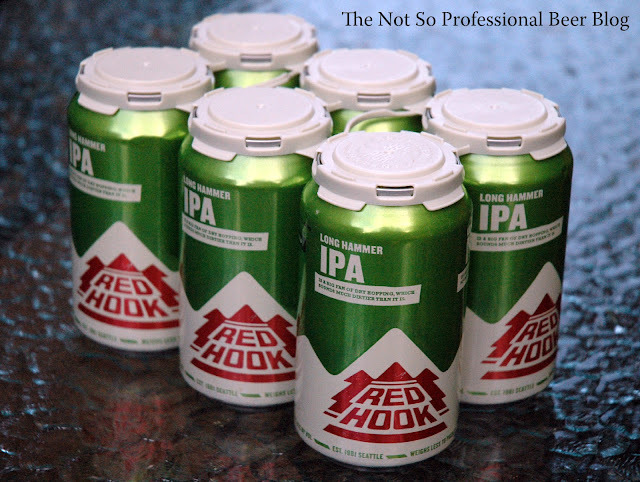 May 1, 2012 – Woodinville, Wash. – Making it easier than ever to crack open a Redhook anywhere – camping, hiking, tailgating, fishing, or wherever else glass is not allowed – Redhook Brewery has released Long Hammer IPA in cans. Hitting shelves nationwide this month, consumers can now enjoy an ice cold can of Long Hammer IPA just about wherever and whenever they please. Where do you crush Redhook? Redhook’s Long Hammer IPA cans were specially designed to weigh much less being packed out than packed in, which means beer drinkers can enjoy Redhook in lots of new places – especially those where bottles aren’t allowed. In recent weeks, Redhook has been making his way to some of those places, crushing Long Hammer cans, and sharing photos with Facebook fans along the way. Sure, not all of those places are ordained by city officials for beer drinking, but it’s a lot easier to hide the sound of cans clanking together than bottles. And hey, while Redhook isn’t looking for trouble, he’s not opposed to it either. First released in 1984, Redhook’s Long Hammer IPA uses a generous amount of hop both during the boil and at dry-hopped at the end of the fermentation process to give the IPA its characteristic bitterness and piney citrus aroma and flavor. Redhook IPA has a medium body, crisp finish and moderate alcohol levels and bitterness (6.2% ABV and 44 IBU) making this one of America’s most drinkable and best-selling IPAs. This beer was much better BEFORE they recently downed the ABV from 6.5% to 6.2%. You can tell the taste isn't as strong and I won't buy it again. I don't know why they changed it but its been in the last few months.